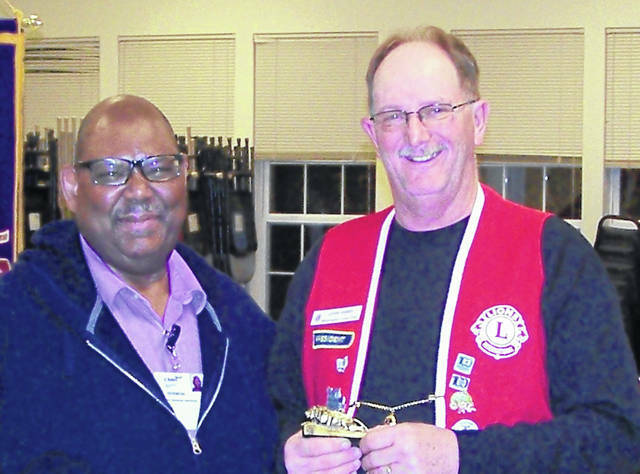 Lions Club President John Hibbs, right, presents a Lion statuette to Vermon Dillon. WILMINGTON — Vermon Dillon spoke at the Feb. 4 Lions Club meeting about his long association with the Boys State program dating back to 1975, when he was a junior in high school and a student participating in Boys State in his home state of Louisiana. The program prepares young men to become leaders and for their future, whether or not they choose to become an elected public servant. He said that, being a person of color, he was unprepared for his first experience, in the segregated South, of sharing a room with a white person. He soon realized this was going to be an unforgettable experience. He was advised that the important thing for him during this program was to focus on playing the role of being a politician, and to have an opinion and to be able to express, defend and sell that opinion to others. The students were to role-play political positions and to run as a candidate for those positions. Their fictionalized political parties were called Federalist and Nationalist, not intended to represent actual political parties. Vermon Dillon moved to Ohio in 1992 and has been on the Buckeye Boys State Board ever since.